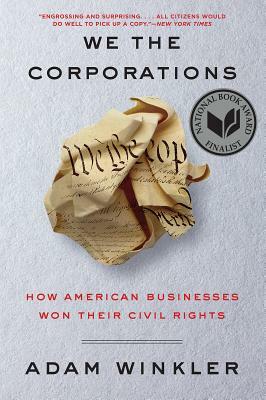 In a revelatory work praised as "excellent and timely" (New York Times Book Review, front page), Adam Winkler, author of Gunfight, once again makes sense of our fraught constitutional history in this incisive portrait of how American businesses seized political power, won "equal rights," and transformed the Constitution to serve big business. Uncovering the deep roots of Citizens United, he repositions that controversial 2010 Supreme Court decision as the capstone of a centuries-old battle for corporate personhood. "Tackling a topic that ought to be at the heart of political debate" (Economist), Winkler surveys more than four hundred years of diverse cases--and the contributions of such legendary legal figures as Daniel Webster, Roger Taney, Lewis Powell, and even Thurgood Marshall--to reveal that "the history of corporate rights is replete with ironies" (Wall Street Journal). We the Corporations is an uncompromising work of history to be read for years to come.